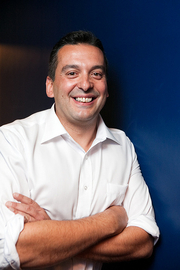 Christos Tsiolkas has 1 media appearance. Three award-winning authors discuss their most recent novels, in which the setting factors as significantly as the characters. Lewis DeSoto will host and moderate. David Bergen is the award-winning author of eight novels, including The Time in Between, winner of the 2005 Scotiabank Giller Prize, The Matter with Morris, shortlisted for both the Scotiabank Giller Prize and the International IMPAC Dublin Literary Award, and the bestselling The Age of Hope, a finalist for CBC Canada Reads in 2013. Bergen presents Leaving Tomorrow, an emotionally powerful story about a hopeful young man who yearns for a larger life outside of his small town in Alberta. Lewis DeSoto's latest novel is The Restoration Artist. An artist as well as a writer, he has exhibited his paintings across Canada. A former editor of the Literary Review of Canada, DeSoto has published essays and short stories in numerous journals, and he was awarded the Books in Canada/Writers’ Union Short Prose Award. His novel A Blade of Grass was nominated for the Man Booker Prize, the Royal Society of Literature Ondaatje Prize and the William Saroyan International Prize for Writing. He is also the author of a biography of Emily Carr, part of the Extraordinary Canadians series. Christos Tsiolkas is an author, playwright, essayist and screenwriter. His novel The Slap won the Commonwealth Writer’s Prize, the Australian Literature Society Gold Medal and the Vance Palmer Prize for Fiction, and was longlisted for the Man Booker Prize. Tsiolkas presents his fifth novel, Barracuda, a moving story about a talented young swimmer’s struggle towards maturity. Richard Wagamese is the author of 12 previous novels, including Keeper'n Me and Indian Horse, a recent Canada Reads finalist. He is also the author of several acclaimed memoirs, including the bestselling One Native Life and One Story, One Song, which won the George Ryga Award for Social Awareness in Literature. He leads writing and storytelling workshops across the country, and makes frequent appearances as a speaker. Wagamese presents Medicine Walk. Set in the dramatic landscape of the BC Interior, it is a novel about love, friendship, courage and the idea that the land has within it powers of healing. Writers Jacek Dehnel, Laila Lalami, Christos Tsiolkas and Richard Wagamese read from their latest works. James Grainger hosts. Jacek Dehnel is a poet, novelist, painter and translator. In 2005 he was awarded Poland's Koscielski Prize for promising new writers, becoming one of the youngest ever recipients. He studied Polish Literature at Warsaw University and wrote his PhD on the Polish translations of Philip Larkin. Dehnel presents Saturnus, a fictionalized version of the personal life of the great Spanish painter Goya. The story is built around the theory that Goya's horrific series of Black Paintings were in fact the work of his son Javier, and were Javier's way of expressing his feelings about his father. James Grainger is the author of The Long Slide, which won the ReLit Award for short fiction. His reviews and articles have appeared in the Toronto Star, Quill & Quire, The Globe and Mail, Elle Canada, Men's Fashion, Sharp and Rue Morgue. His debut novel, Harmless, will be published in May by McClelland & Stewart. Laila Lalami was born and raised in Morocco. She attended Université Mohammed-V in Rabat, University College in London and the University of Southern California, where she earned a PhD in linguistics. Her work has appeared in numerous publications, including The New York Times and Newsweek. She is the recipient of a British Council Fellowship, a Fulbright Fellowship and a Lannan Foundation Residency Fellowship. She is currently an associate professor of creative writing at the University of California at Riverside. Lalami presents The Moor’s Account, a sweeping historical saga of a young man’s journey from successful merchant to slave to triumphant survivor. Christos Tsiolkas has long been one of Australia’s most glittering literary treasures – and thanks to the success of his bestselling barbecue-stopper The Slap, he’s now a household name. In his sixth novel, Barracuda, Tsiolkas once again holds up a mirror to the deepest insecurities and most dearly held dreams of middle class Australia. Tsiolkas delivers a searing exploration of failure, and how to come back from it − on the back of his greatest literary success. Christos Tsiolkas's book Barracuda was available from LibraryThing Early Reviewers. Christos Tsiolkas is currently considered a "single author." If one or more works are by a distinct, homonymous authors, go ahead and split the author. Christos Tsiolkas is composed of 3 names. You can examine and separate out names.